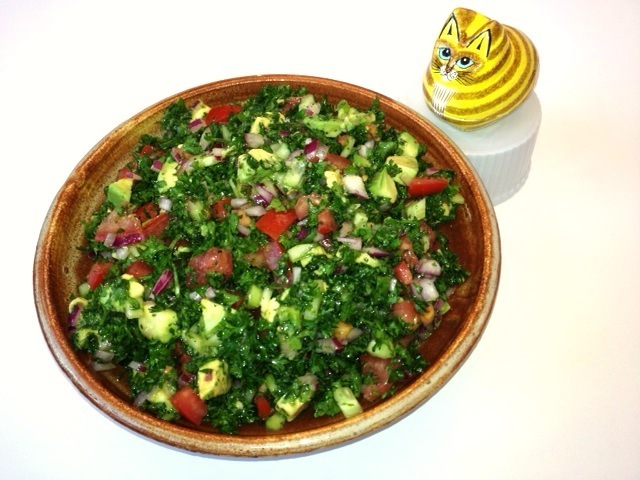 Grain-Free Tabouli – An Ancestral Health Food! Today’s herbs are essentially wild plants that have not been tampered with by intentional plant breeding. So unlike most other vegetables, herbs have not been de-nutritionized (my made-up word) by selecting for sweetness and starch — a process that strips many plants of the nutrients ( phytochemicals) that were present in the wild plants our ancestors ate. To learn more about how today’s fruits and vegetables differ nutritionally from those of our ancestors, take a look at these jaw-dropping info-graphics and the NYTimes opinion piece, Breeding the Nutrition Out of Our Food by Jo Robinson, author of the new book, Eating on the Wild Side: The Missing Link to Optimum Health. But reading won’t make you healthy! So let’s head to the kitchen and make a big bowl of Grain-Free Tabouli – a wonderful Middle Eastern salad packed with LOTS of plant nutrition – just like our ancestors once enjoyed! First check your parsley. Is it well dried? If not, spin dry it or blot it dry with paper towels. You don’t want to leave water on the leaves because the water will dilute the tabouli’s wonderful flavor! To a large bowl, add parsley, tomato, cucumber, red onion, and green onion. Mix well. Set aside. To a small bowl (I used a glass measuring cup because it has a spout) add the lemon juice, olive oil, mint, salt, black pepper, and cayenne pepper. Stir to mix. Pour the lemon juice and olive oil mixture over the ingredients in the large bowl. Stir to mix well. Set aside for 15 minutes to let the flavors meld. Add the avocado and mix again. Serve! Parsley – Many recipes call for flat leaf parsley, but I prefer curly parsley because it keeps the ingredients in the tabouli a bit more separated and makes the salad seem more airy. It’s a personal preference. Cucumber – If store bought and not organic, be sure to peel because regular cucumbers are waxed and on the 2013 Dirty Dozen list. Red onion – I like red onion because it looks pretty and tastes great in this salad. To get the most nutrition from your onion, just peel away the papery outer layer , not the first layer of the onion. Lemon juice – Always use fresh squeezed! It’s so much better! Extra virgin olive oil – Here’s how to select an olive oil that delivers lots of plant nutrition and great taste. Mint – My recipe calls for dried mint because when I went to the market to buy mint, it cost almost $3.00 for a small bunch of sad looking mint. But as soon as the mint in my garden takes off, I’ll switch to fresh mint leaves, chopped fine. How much? To taste! Cayenne pepper – A 1/4 teaspoon of ground cayenne pepper doesn’t make the tabouli hot/spicy. It’s just a neat trick for punching up flavor! Avocado – This was a last minute addition. After mixing the salad, I thought it could use something a bit creamy, so I cut up an avocado and added mixed it into the tabouli. Balsamic vinegar – When we were tasting this tabouli, my husband said, “I love it, but it could be a bit sweeter.” After adding a few dashes of a balsamic vinegar to his tabouli, he gave it two thumbs up. If you decide to add balsamic vinegar, be sure to use a high quality, well-aged (15 or more years) balsamic vinegar so you get that wonderful mellow flavor and not a strong bite. Cauliflower – Finely chopped raw cauliflower. Canned tuna or sardines – Top tabouli with tuna or sardines for a great little meal! Feta cheese – Top tabouli with feta cheese. My favorite is the Garden of Eden Sheep Feta available at Trader Joe’s and (possibly also at your local Costco). Slices tomatoes – Serve tabouli over a few slices of luscious heirloom tomatoes! Fresh squeezed orange juice instead of lemon juice – To make tabbouli less lemony and more sweet — especially if you are trying to introduce this salad to kids who are accustomed to food on the sweet side — you might want to substitute fresh squeezed orange juice for some or all of the lemon juice. Leni, by far one of your best posts in terms of education and visual stimulation. Well done and look forward to increasing my knowledge of great foods. Love your nutritional insights.